Adam@Roof Beam Reader’s Austen in August event reminded me to read Lady Susan, The Watsons and Sanditon. Jane Austen has long been one of my favourite authors, ever since I read my mother’s copy of Pride and Prejudice and since then I have re-read it several times and her other full length novels too. But I’ve never read Lady Susan, The Watsons and Sanditon before. In fact it was only reading Carol Shields’ biography of Jane Austen quite some years ago now that I discovered that she had written these books, none of which were published in her lifetime. Lady Susan is a finished novella, whereas The Watsons and Sanditon are two unfinished fragments. 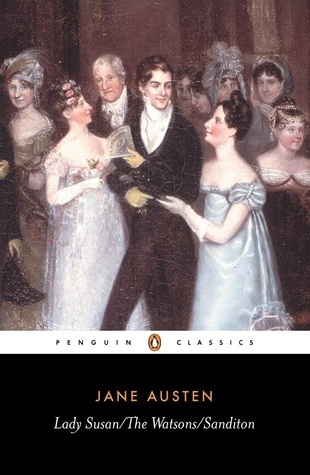 Lady Susan and The Watsons were first published in 1871 by her nephew, James Edward Austen-Leigh in his Memoir of Jane Austen, including an account of Sanditon . The full text of Sanditon wasn’t published until 1925. According to Margaret Drabble’s introduction to my Penguin Classics edition there is some evidence that Lady Susan was probably written between 1793-4, when Jane Austen was about 20 years old. Drabble thinks this is the least satisfactory of the three stories, but I can’t agree with her view. I was completely taken with it. Told in a series of letters, Lady Susan is the story of an unscrupulous widow who plans to force her daughter into a marriage against her wishes. Lady Susan is an attractive and entertaining and totally wicked character, who nevertheless almost manages to fool people for some of the time at least. She is also trying to captivate her sister-in-law’s brother, whilst still holding on to the affections of a previous lover. As I was reading Lady Susan it reminded of Laclos’s Les Liaisons Dangereuses, not just because both are epistolary but also the content – manipulative and evil characters without any moral scruples, who delight in their power to seduce others. I wondered if it was possible that Jane Austen had known of this book. It was published in 1782, so it is possible that she knew of it, even if she had not actually read it. To my mind Lady Susan is unique in Jane Austen’s works and I was delighted to read it. It’s written with style, confidence and humour convincingly illustrating 18th century morals and manners. Jane Austen began writing this in 1804, her father died in 1805 and she never finished it. Its main character is Emma Watson who after fourteen years of absence returns to her father’s house after being brought up by a wealthy aunt. She had grown up in an affluent household and until her aunt had remarried she’d had expectations of an inheritance. She joins her three unmarried sisters, living with their invalid father and looking for husbands whilst struggling for money. Mr Watson is a clergyman, so on his death they will lose their home. Maybe it was the parallel with Jane and Cassandra Austen’s own situation that caused Jane to abandon the novel when her own father died. I liked The Watsons but with just this fragment to go off it is a bit basic and does seem rather similar to Pride and Prejudice. I wished she had finished it. I thoroughly enjoyed Sanditon, even in its unfinished state. It’s the last fiction that Jane Austen wrote, beginning it in January 1817, the year she died. She was ill and the subject of health is one of its themes, but not in a serious or gloomy way. It has a lively, bright and humorous tone, with three of the characters being hypochondriacs, wonderfully satirised by Jane Austen. Sanditon contrasts the old world with the new upcoming world. Mr Parker has moved from his old comfortable family house set in a sheltered dip two miles from the sea to a new elegant house, which he has named Trafalgar House, not far from a cliff from which there is a descent to the sea and the bathing machines. Granted it has all the ‘grandeur of storms’, which rocked their bed whilst the wind rages around the house. There is so much more in these stories than I can write about here (this post is far too long anyway). I shall enjoy re-reading them in the future. They are so different from each other, probably reflecting the different periods of her life when they were written. And I can’t decide between Lady Susan and Sanditon which one I like best. I’ve never read these either – I must! Reginald Hill used Sanditon as a basis for one of the later Dalziel and Pacoe novels – A Cure for All Diseases. And from what you say about the original, my memory suggests he used more than just the name of the resort. Now I want to read the original and re-read the Hill! And now I want to read A Cure for All Diseases – I’ve had a copy for several years now and never realised Hill had used Sanditon as its basis. I’ve dug it out – many of my books are double shelved and this book was hidden behind others. I haven’t read these three either and they sound fascinating, especially with the contrast in writing between the three. More for my list. Austen has always had a special place in my heart too. Thank you so much for alerting me to this collection. I had no idea that she wrote these also. I’m going to hunt it down pronto. There are some who feel that the similarities between the Reginald Hill book and that of Jane Austen, are not confined solely to references to the place of Sanditon (Sandytown) – It looks as though the lines may be far more blurred than that! I was also confused by the fact that two Reginald Hill books seemed to reference Sanditon, until I realised that they were both number 23 in the Dalziel and Pascoe series. In fact ‘A Cure For All Diseases’ was also published as ‘The Price Of Butcher’s Meat’ – not half so appealing now? I haven’t read any Austen for years, however I am intrigued by the thought of these three short stories being served up in one volume. ‘The Price of Butcher’s Meat’ is a puzzling title compared to ‘A Cure for All Diseases’, but maybe it will be clearer when I’ve read the book. For my Classics Club list I decided to focus on finishing Austen’s full novels. This month I completed this aim by reading Mansfield Park. Now I am interested in reading these novellas/unfinished novels, especially if I can get them in a book together.